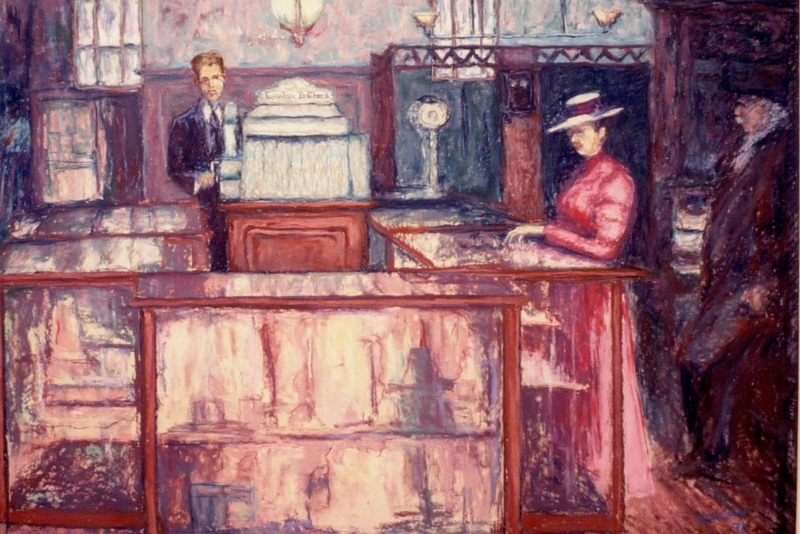 A painting by Bettye Reagan, a local artist in Central Florida, inspired by a photograph of the Lawton General Store Oviedo, Florida sometime between 1900 and 1939. The store was run by two brothers: Thomas Willington Lawton (1882-1963) and Winborn Joseph Lawton, Sr. (1881-1971). T. W. Lawton graduated from Rollins College in 1903. He later received his master's degree from Andover Newton College in Boston, Massachusetts. Following college, Lawton returned to Oviedo, where he married Charlotte "Lottie" Lee (1887-1984) and served as the principal of the Oviedo School from 1905 to 1907. In 1916, he became the first elected Superintendent of Schools of Seminole County. He held that post until 1952 and passed away 11 years later in 1963. Lawton Elementary School is named in his honor. Original painting: Reagan, Bettye. Lawton's Store. 1998: Private Collection of Bettye Reagan. Digital reproduction of original painting: Reagan, Bettye. Lawton's Store. 1998.
art; artists; Bettye Jean Aulin Reagan; Bettye Reagan; general store; hardware; Lawton General Store; Oviedo; painters; paintings; pastels; retail; shop; store; T. W. Lawton; Thomas Willington Lawton; W. J. Lawton, Sr.; Winborn Joseph Lawton, Sr.
Reagan, Bettye Jean Aulin. 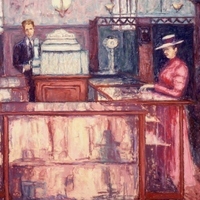 “Lawton's Store by Bettye Reagan.” RICHES of Central Florida accessed April 25, 2019, https://richesmi.cah.ucf.edu/omeka/items/show/6940.